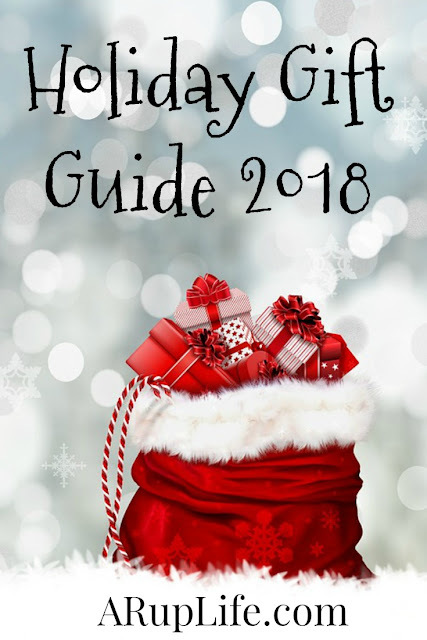 A RUP LIFE: Holiday Gift Guide 2018! Christmas is right around the corner. There are only 10 Fridays until the big day! Time to get busy! I've already started shopping because I have to do it slowly to get it all done. I'm not one of those shop all day and get it all done at one time kind of people. I like to plan each present and do a little research. I also like to deal shop so I hit target when they have a great coupon or cartwheel. The main stores I usually go to are target, walmart, kohls, and the mall. It used to be ToysRus - which I will truly miss! How many people do you shop for? We have cut down our gift giving list significantly but we still have four kids, parents, and others to purchase for. I try to stick to a budget and list so I don't buy too many impulse items. This is so much harder when you have little kids because their toys are so much cheaper than what the teenagers ask for. We also have that collector bug so I have to really stay on task or I end up with a bunch of stuff for me instead of what is on my list. We always do something for the teachers in my kids lives too. We only have church teachers since we homeschool but there are about seven people combined that we have to get a little something for. I don't think my husband understands all the work that goes into this holiday! I won't complain to loudly because the past few years he has helped me wrap which is the biggest headache and my least favorite task. He also does most of the decorating (and he usually takes it all down too!) Oh! He bakes too!!! Honestly I can't complain all I do for Christmas is cook and shop! Ha! Have you made it this far into my ramble about Christmas? If so I really came here today to share about our holiday gift guide that will be starting soon. If your new to A Rup Life, each year I do a holiday gift guide on the site featuring some amazing products. Things for the house, kids and even a few pampering items. It is a blast! Often times there is a giveaway too - so be sure to stop by often and enter often! By visiting the full site you can see all the current giveaways on the sidebar. (There are always giveaways but holiday season always explodes!) I love this time of year on the blog because I love sharing wonderful product recommendations with you all. I hope it is a help and blessing to you! If your interested in having your product featured on ARupLife.com's Holiday Gift Guide please reach out to me via email at aruplife@gmail.com. My readers love to hear about new products and see them in action! I have two popular ways to have your product featured. The first is with a review where I share our personal experience with the product and the second is a review with giveaway (this is the most popular option, as it gives the most exposure!) The gift guide starts late October and runs until early December. We have men, women and kids of all ages and welcome family friendly products to be featured! Looking forward to a great holiday season!